The kidneys play a critical role in maintaining the systemic balance of Mg2+ and Ca2+ cations. The reabsorptive capacity of these divalent cations adapt to changes in their plasma concentrations. Active reabsorption of Mg2+ and Ca2+ takes place in the distal convoluted and connecting tubules, respectively, and is initiated by cellular transport through selective transient receptor potential (TRP) channels located along the luminal membrane and modulated by hormonal stimuli. 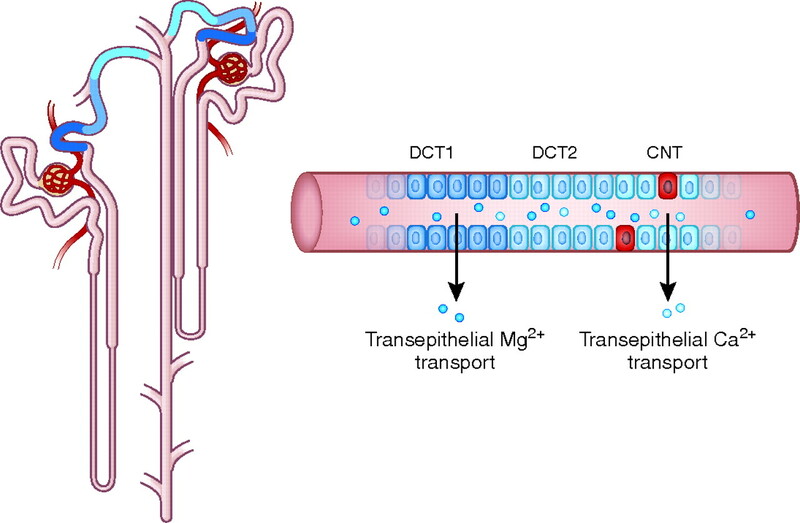 Recent characterization of underlying molecular defects in renal Mg2+ handling illuminate complex transport processes in the kidney and their contribution to the overall mineral balance. Likewise, studies of Ca2+ transport proteins in null mice disclose molecular mechanisms maintaining normal plasma Ca2+ levels and the hypercalciuria-related adaptations important in the prevention of kidney stones. Current knowledge of Mg2+ and Ca2+ transport is summarized here as comprehensive cellular models of the distal nephron. In the last decade, considerable progress has been made in elucidating the molecular mechanisms underlying the reabsorption of these minerals by the kidney. Instrumental in this respect are studies of rare monogenic diseases related to defective renal Mg2+ handling and genetically modified mice with deleted Ca2+ transport proteins.4,5 These studies identified new transport proteins and have led to the development of new concepts for the renal handling of minerals. Active reabsorption of Mg2+ and Ca2+ takes place in the distal part of the nephron only. More precisely, this part of the nephron is comprised of the distal convoluted tubule (DCT) and the connecting tubule (CNT) leading to the collecting duct.6 The former can be further subdivided into early (DCT1) and late (DCT2) segments. Based on micropuncture experiments and the conspicuous localization of transport proteins, active Mg2+ transport is confined to the DCT1 and DCT2 segments, whereas active Ca2+ reabsorption mainly occurs along the DCT2 and CNT segments (Figure 1).1 Thus, DCT2 functions as a transition area between Mg2+ and Ca2+ reabsorption. 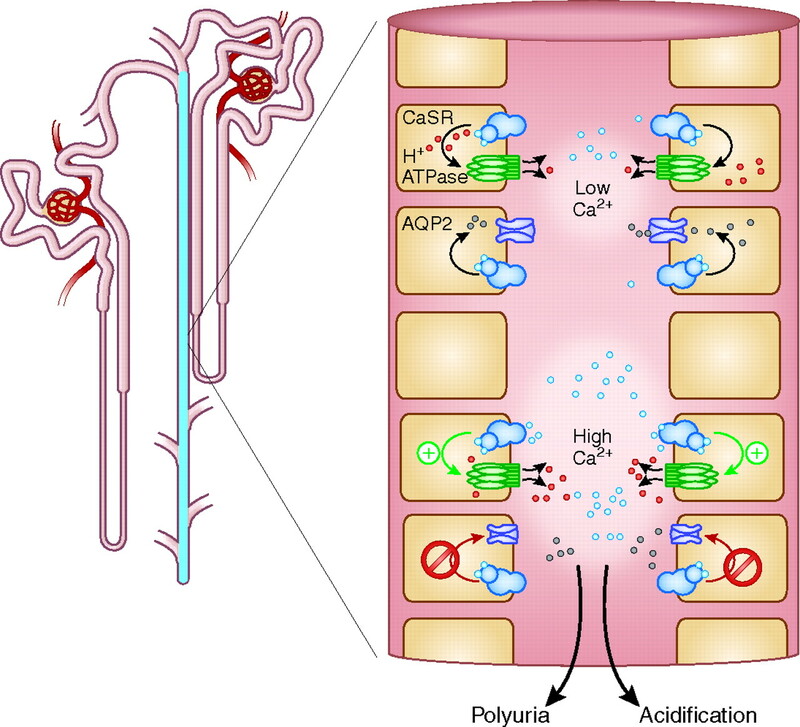 Overview of Mg2+ and Ca2+ handling in the distal nephron. The active reabsorption of the minerals Mg2+ and Ca2+ takes place in the distal part of the nephron only. More precisely, this part of the nephron is comprised of the DCT and the CNT to the collecting duct. The former can be further subdivided into an early (DCT1) and late (DCT2) portion. Active Mg2+ transport is confined to the DCT1 and DCT2, whereas active Ca2+ reabsorption mainly occurs in the DCT2 and CNT segments. Thus, DCT2 functions as a transition area between Mg2+ and Ca2+ reabsorption. The DCT is famous for the presence of the thiazide-sensitive NaCl co-transporter (NCC) along the luminal membrane, which is energized by a Na+ gradient generated by the basolateral Na+-K+-ATPase.7,8 Active transcellular Mg2+ transport along the DCT is envisaged by the following sequential steps (Figure 2).9 Driven by a favorable membrane potential, Mg2+ enters the DCT cell through an apical epithelial Mg2+ channel. The chemical driving force for Mg2+ is limited because the extra- and intracellular Mg2+ concentrations are in the same millimolar range. Importantly, Mg2+ entry into the cells seems to be the rate-limiting step and thus the site of regulation. Subsequently, Mg2+ diffuses through the cytosol to be extruded actively against an electrochemical gradient across the basolateral membrane. For the Mg2+ extrusion, unidentified candidates could be a Na+-dependent exchange mechanism or an ATP-dependent Mg2+ pump. Some of the salient features are described below. Mechanism of active Mg2+ reabsorption in DCT1 and DCT2 segments. Apical membrane TRPM6 channels are located in the apical membrane, which facilitates transport of Mg2+ from the tubular fluid into the cell. Mg2+ reabsorption is primarily driven by the luminal membrane potential established by the voltage-gated K+ channel, Kv1.1. The Na+-K+-ATPase, situated in the basolateral membrane, provides a sodium (Na+) gradient that is used by the thiazide-sensitive NCC to facilitate transport of Na+ from the tubular fluid into the cytoplasm and a K+ gradient to generate local membrane potential. K+ is supplied to the Na+-K+-ATPase through recycling through Kir4.1. The γ-subunit of the Na+-K+-ATPase regulates the function of Na+ pump. Transcription factor HNF1B (hepatocyte nuclear factor 1 homeobox B) regulates the expression of the γ-subunit of the Na+-K+-ATPase. EGF is the first magnesiotropic hormone to regulate active Mg2+ reabsorption through the TRPM6 channel. The voltage-gated K+ channel, Kv1.1, is a new protein thought to regulate Mg2+ influx through TRPM6. Recently, there has been evidence that a mutation in KCNA1 encoding Kv1.1 causes autosomal dominant hypomagnesemia.16 The phenotype detectable from infancy consists of recurrent muscle cramps, tetany, tremor, muscle weakness, cerebellar atrophy, and myokymia. The K+ channel co-localizes with TRPM6 along the luminal membrane of the DCT. The identified mutation results in a nonfunctional channel with a dominant-negative effect on wild-type channel function.17 Thus, Kv1.1 is a new luminal K+ channel in the DCT that establishes favorable luminal membrane potential controlling TRPM6-mediated Mg2+ reabsorption. Further support for an active role of the γ-subunit in Mg2+ reabsorption is suggested by the observation that a transcription factor, hepatocyte nuclear factor 1B (HNF1B), modulates the FXYD2 gene.20 Hypomagnesemia, hypermagnesuria, and hypocalciuria are observed in one half of the HNF1B mutation carriers. Analyses of the FXYD2 promoter region identify two highly conserved HNF1B recognition sites. 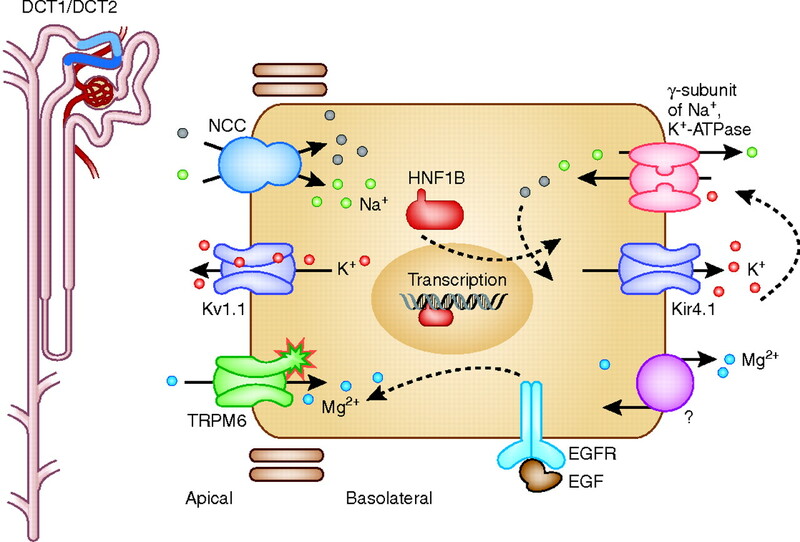 Future studies should confirm the role of HNF1B in the regulation of FXYD2 and possibly other components of the molecular machinery involved in renal Mg2+ handling. Two independent studies recently described a mutation within the KCNJ10 gene as the underlying cause of a hypomagnesemia syndrome.21,22 The first study described two nonrelated consanguineous families with a disorder characterized by epilepsy, ataxia, sensorineurol deafness, and tubulopathy (also referred to as SeSAME), whereas the other study described four kindreds with similar clinical findings. The KCNJ10 gene encodes a K+ channel called Kir4.1, expressed in brain, ear, and kidney, in keeping with the phenotype observed in these patients. The renal phenotype of EAST syndrome (a syndrome characterized by epilepsy, ataxia, sensorineural deafness, and tubulopathy) is similar to the Gitelman's syndrome phenotype and consists of polyuria, hypokalemic metabolic alkalosis, hypomagnesemia, and hypocalciuria.22 In kidney, Kir4.1 is expressed along the basolateral membrane of DCT cells with the Na+-K+-ATPase. Kir4.1 is thought to recycle K+ into the interstitium to allow a sufficient supply of K+ for optimal Na+-K-ATPase activity. The recent knowledge concerning the molecular nature of Mg2+ transporting proteins offers for the first time a comprehensive cellular model for transepithelial Mg2+ reabsorption (Figure 2). The epithelial Mg2+ channel TRPM6 facilitates Mg2+ entry from tubular fluid through an energized local electrochemical gradient. Importantly, the DCT cell lacks a substantial chemical gradient for Mg2+. The luminal membrane potential in the DCT favoring luminal Mg2+ influx is approximately −70 mV and likely established by the luminal Kv1.1. channel. The basolateral extrusion mechanism for Mg2+ remains elusive and is a subject for further study. The Na+-K+-ATPase in the basolateral membrane generates opposing K+ and Na+ gradients. Importantly, Kir4.1 enables the basolateral recirculation of K+, thereby supplying sufficient K+ during high transport rates of the Na+-K+-ATPase; the basolateral γ-subunit in all likelihood supports the Na+ pump. Apparently, these special features are necessary to enable the substantial transport of NaCl by NCC and Mg2+ by TRPM6 in the DCT cell. Finally, EGF stimulates transcellular transport of Mg2+. Activation of the basolateral EGF receptor promotes the insertion of TRPM6 channels into the luminal membrane to stimulate this Mg2+ reabsorption. Thus, in the last two decades, many Mg2+ transport proteins have been identified and characterized by several research groups; the next step will be to develop specific therapeutics to treat the corresponding forms of hypomagnesemia. In DCT2 and CNT segments, Ca2+ reabsorption takes place against its chemical gradient, indicating that the transport is active.26 In addition to the ubiquitously expressed Na+-K+-ATPase, the Na+/Ca2+ exchanger (NCX1) and the plasma membrane ATPase type 1b (PMCA1b) are also found along the basolateral site of the DCT2 and CNT segments.2 DCT2 shares similarities with the CNT segment, because both segments express the transient receptor potential vanilloid subtype 5 (TRPV5) channel and the Ca2+-binding protein, calbindin-D28K. Transepithelial transport of Ca2+ is a three-step procedure and is outlined in more detail below (Figure 3). Mechanism of active Ca2+ reabsorption in DCT2 and CNT. A three-step process facilitates active and transcellular Ca2+ transport. The first step is entry of luminal Ca2+ at the apical side of the cell through the TRPV5 channel. Subsequently, calbindin (CaBP) buffers Ca2+, and the Ca2+ diffuses to the basolateral membrane. At the basolateral membrane, Ca2+ is extruded by PMCA1b and NCX1. This process is controlled by calciotropic hormones including parathyroid hormone and 1,25(OH)2D3. The TRPV5-null (TRPV−/−) mouse provides compelling evidence for the physiologic function of this channel. Active Ca2+ reabsorption in DCT2 and CNT segments is severely impaired in these null animals, because TRPV5−/− mice excrete ∼10-fold more Ca2+ than their wild-type littermates, in line with a postulated gatekeeper function for TRPV5 in active Ca2+ reabsorption.33 Electrophysiologic studies showed constitutive activity of TRPV5 at low intracellular Ca2+ concentrations and physiologic membrane potentials.34 The current–voltage relationship of TRPV5 shows strong inward rectification.2,34 Another important functional feature is that TRPV5 is the most Ca2+-selective member of the TRP superfamily.34 The single channel conductance, Po, and the number of channels at the plasma membrane determines cellular TRPV5 activity. This activity is under the control of various factors like hormones, intracellular Ca2+, and other intracellular messengers. Ample evidence of a direct role for vitamin D in the positive regulation of TRPV5 comes from several animal studies, particularly those involving 25-hydroxyvitamin D3-1α-hydroxylase– and vitamin D receptor–null mice.35,36 A direct relationship between 1,25(OH)2D3-induced expression of Ca2+ transport proteins and transcellular Ca2+ transport is known from studies of cultured cells from DCT and CNT cells.37,38 Together these studies suggest a consistent 1,25(OH)2D3 sensitivity of TRPV5 and the calbindins, and, to a lesser extent, the basolateral extrusion systems involving NCX1, a Na+/Ca2+exchanger, and PMCA1b, a plasma membrane Ca2+-ATPase. Thiazide diuretics, in contrast to loop diuretics, have the unique characteristic of decreasing Na+ reabsorption while increasing Ca2+ reabsorption. In addition, mutations in the NCC gene encoding the NaCl co-transporter cause Gitelman's syndrome. Patients with Gitelman's syndrome exhibit hypovolemia, hypokalemic alkalosis, hypomagnesemia, and hypocalciuria.39 Intriguingly, the molecular mechanisms responsible for the hypocalciuria and hypomagnesemia with thiazide administration or in Gitelman's syndrome remain elusive. Two hypotheses exist with respect to the Ca2+-sparing effect of thiazides.40,41 First, renal salt and water loss caused by thiazide treatment results in contraction of the extracellular volume (ECV), which triggers a compensatory increase of proximal Na+ reabsorption. This in turn enhances the electrochemical gradient driving passive Ca2+ transport in proximal tubular segments.6,39,42 Second, thiazide treatment stimulates Ca2+ reabsorption in DCT, possibly through the TRPV5 channel, that could explain the Ca2+-sparing effect.40 We showed in rats that hydrochlorothiazide-induced hypocalciuria is accompanied by a significant decrease in body weight compared with controls, confirming ECV contraction.43,44 Because sodium depletion results in a similar hypocalciuria, it is likely that the ECV contraction by itself is responsible for the thiazide-induced hypocalciuria. Further evidence supporting this notion is the finding that sodium repletion during thiazide treatment, thereby preventing the ECV contraction, normalizes the calciuresis. A direct role for TRPV5 in the thiazide-induced hypocalciuria seems unlikely, because thiazides also have a hypocalciuric effect in TRPV5−/− mice, and the overlap in the expression of NCC and TRPV5 in the distal part of the nephron is restricted to DCT2.44 Taken together, enhanced proximal tubular Na+ transport as a consequence of ECV contraction stimulates paracellular Ca2+ transport and best explains the tubular mechanism for thiazide-induced hypocalciuria. TRPV5−/− mice display hypercalciuria from impaired active Ca2+ reabsorption but also hyperphosphaturia, polyuria, and increased urinary acidification.33 The latter two adaptations seem highly beneficial because there are no renal calcium precipitates. Polyuria also diminishes the risk of renal stone formation by reducing urinary Ca2+ concentration. In mice, calciuresis linearly correlates with urinary volume because an increase in Ca2+ excretion leads to an enhanced urinary volume. The consistent polyuria in hypercalciuric TRPV5−/− mice, noted by a substantial decrease in urinary osmolality, is caused by downregulation of renal AQP2 water channels, possibly a result of activating the Ca2+-sensing receptor along the luminal membrane of the collecting duct.45 Furthermore, gene ablation of the collecting duct-specific B1 subunit of H+-ATPase in TRPV5−/− mice abolishes enhanced urinary acidification, which resulted in severe tubular precipitations of Ca2+-phosphate in the renal medulla.45 Thus, in TRPV5−/− mice, activation of the renal Ca2+-sensing receptor promotes H+-ATPase–mediated H+ excretion and downregulation of AQP2, leading to urinary acidification and polyuria, respectively (Figure 4). Molecular mechanism of Ca2+-induced polyuria and urinary acidification. The Ca2+-sensing receptor (CaSR) is localized at the apical site of principal and intercalated cells of the collecting duct. AQP2 proteins are responsible for water reabsorption, whereas H+-ATPases pump H+ into the tubular fluid. During hypercalciuria, increased urinary Ca2+ levels activate the CaSR. CaSR activation leads to AQP2 downregulation and polyuria. Furthermore, the CaSR triggers urinary acidification by increasing the H+-ATPase activity. Both polyuria and increased urinary acidification prevent the precipitation of renal Ca2+-phosphate. Ca2+ reabsorption in the kidney, and particularly in the distal DCT2 and CNT segments, is crucial for the maintenance of the Ca2+ balance. The identification and characterization of the proteins mediating this active Ca2+ transport provides novel insight and means to study molecular relationships. 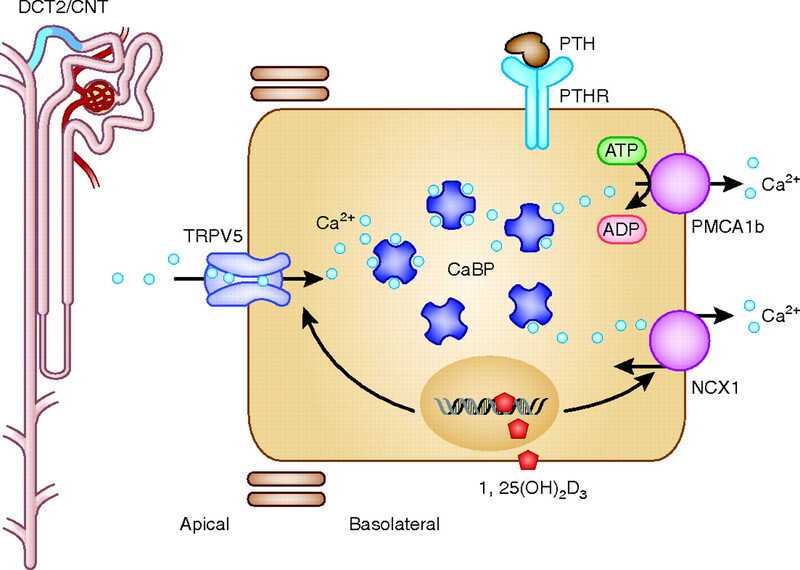 In these segments, TRPV5 facilitates the gatekeeper function of Ca2+ entry, and therefore, a tight control of its activity enables the organism to adjust Ca2+ reabsorption according to the demands of Ca2+ load. The molecular mechanism of Ca2+ shuttling between calbindin-D28K on one site and NCX1 and PMCA1b on the other site is not clear. Another interesting and unaddressed question is the regulation of NCX1 and PMCA1b in DCT2 and CNT cells. Whether there is a crosstalk between apical Ca2+ entry and basolateral Ca2+ extrusion regulatory systems is not known. The next step is to investigate how these Ca2+ transport proteins communicate with each other to facilitate optimal and regulated Ca2+ reabsorption under conditions of disturbed Ca2+ homeostasis. Finally, the role of TRPV5 in Ca2+-related disorders needs further study. There are many people I would like to acknowledge and thank for their invaluable contribution to my work. It has been an honor and privilege to be working with each one of them over the last 25 years. In particular, I would like to thank my colleague, Joost Hoenderop, for critical reading of this manuscript before submission and for his continuous support during our long-term collaboration. Furthermore, I would like to acknowledge the contribution of many colleagues who spent some time in my laboratory including technicians, PhD students, postdocs, and staff members. Finally, I would like to thank all my collaborators for their seminal help and making science so much fun. It was and is a great pleasure to work with you all.